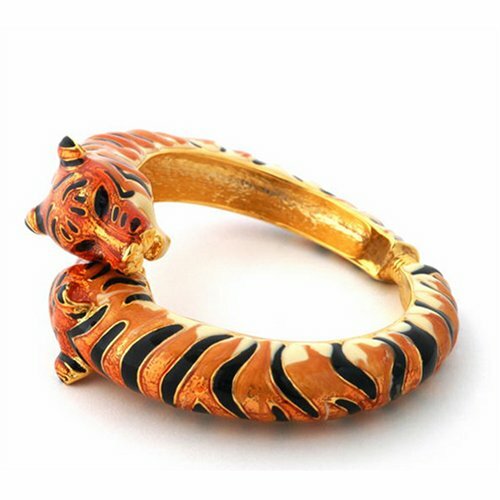 When it comes to safari style, this bracelet from the Kenneth Jay Lane Collection really roars. Two majestic tigers grace the ends of this bold bypass-style bracelet. Done in epoxy enamel, the tiger print includes black, yellow, and orange, with black enamel eyes. Goldtone accents finish the ears, nose, whiskers, and mouth. Bracelet has spring hinge closure, fits average-size wrist and at its widest point measures approximately 3/4"W. NOTE: Animals are back in a big way this Fall!! Add a touch of wild to your look with this chic bracelet. Two majestic tigers grace the ends of this bold bypass-style bracelet. Tiger print with black enamel eyes. Goldtone accents finish the ears, nose, whiskers, and mouth.